Dhaka, Oct 15 (Just News): A general diary (GD) has been lodged against Gonoshasthaya Kendra founder Dr Zafrullah Chowdhury for his recent remarks on Army Chief Gen Aziz Ahmed at a TV programme. Major M Rakibul Alam filed the GD with Cantonment Police Station on Friday describing Zafrullah’s remarks as untrue, motivated and seditious, said Kabir Hossain Howlader, inspector (investigation) of the police station. Masudur Rahman, deputy commissioner (media) of Dhaka Metropolitan Police, said detective branch of DMP has been tasked with the investigation following approval from the court and the respective ministry. In a talk show titled “Sampadokyo” aired on Somoy TV on October 9, Zafrullah said the army chief was the force's Chattogram area GOC when a huge cache of military weapons and ammunitions “went missing, were stolen or sold out” from there. 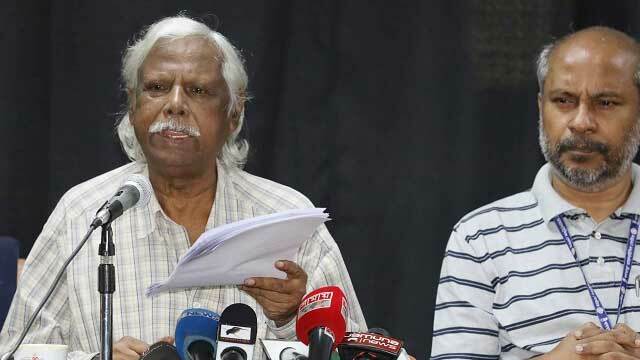 On October 13, Dr Zafrullah Chowdhury apologised for his remarks. “I carelessly presented wrong information about current Army Chief General Aziz Ahmed during a discussion at Somoy TV's talk show on October 9. I sincerely apologise for the improper statement and wrong choice of words,” he said at a press conference. In the GD, Alam said during the TV discussion a day before the verdict on the August 21 grenade attack case, Zafrullah irrelevantly came up with a motivated remark against the army chief which is tantamount to the seditious offence and attempt to create unrest in the country. “It is a matter of investigation as for why, with what motive and influenced by whom, such higher educated person made the motivated, fabricated and untrue remarks during the talk show,” Alam said in the GD.